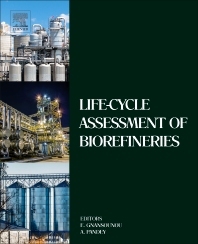 Life-Cycle Assessment of Biorefineries, the sixth and last book in the series on biomass-biorefineries discusses the unprecedented growth and development in the emerging concept of a global bio-based economy in which biomass-based biorefineries have attained center stage for the production of fuels and chemicals. It is envisaged that by 2020 a majority of chemicals currently being produced through a chemical route will be produced via a bio-based route. Agro-industrial residues, municipal solid wastes, and forestry wastes have been considered as the most significant feedstocks for such bio-refineries. However, for the techno-economic success of such biorefineries, it is of prime and utmost importance to understand their lifecycle assessment for various aspects. Primary readers are chemist and (bio) chemical engineering PG/PhD students; Postdoctorate researchers in academia and industry; Engineers (process engineers) in bio-industries; consultants and policy makers. The book is useful for students and researchers engaged in postgraduate or masters programs leading to MSc, MTech or MS degree in Biotechnology, Industrial Biotechnology, Biochemical Engineering, Biological Engineering, Biotechnology & Bioengineering, Biomedical Engineering. Edgard Gnansounou is Professor of modelling and planning of Energy Systems at the Swiss Federal Institute of Technology Lausanne (EPFL) where he is Director of the Bioenergy and Energy Planning Research Group. His current research works comprise techno-economic and environmental assessment of bio-refinery schemes based on conversion of agricultural residues. He is leading research projects in that field in several countries including Brazil, Colombia and South Africa. Edgard Gnansounou is credited with numerous papers in high impact scientific journals. He is member of the editorial board of Bioresource Technology. He graduated with a M.S. in Civil Engineering and Ph.D. in Energy Systems at the Swiss Federal Institute of Technology Lausanne. He was a visiting researcher at the Thayer College, Dartmouth School of Engineering with Professor Charles Wyman (USA), at Polytech of Clermont-Ferrand, University Blaise Pascal (France) and at the Center of Biofuels, the National Institute for Interdisciplinary Science and Technology, Trivandrum (India). He was also a visiting Professor of the African University of Science of Technology (Abuja, Nigeria). He is a citizen of Benin (Africa) and Switzerland. Professor Ashok Pandey is Deputy Director at CSIR’s National Institute for Interdisciplinary Science and Technology at Trivandrum and heading the Centre for Biofuels and Biotechnology Division there. Professor Pandey’s research interests are on bio-based economy development (biomass-based biorefinery) for the production of fuels and chemicals. He has >1000 publications/communications, which include 14 patents & design copyright, 34 books, 100 book chapters, 380 original and review papers, etc with h index of 62 and >16,800 citation (Goggle scholar).